Know how you have to type those alphanumeric characters online to prevent spam? Now those measures seem to be getting scarier by the day. 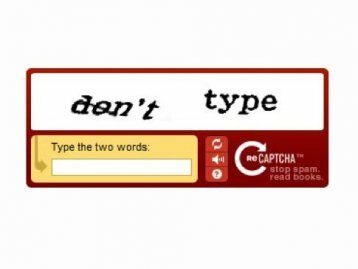 It started with a string of arbit letters, graduated to CAPTCHAs, deformed sets of characters that you’d have to really strain your eyes or make a face, to be able to read; and went on to three characters which sway about (that’s my favourite one by the way). Then came image identification. And there are also those simple math questions, say a “1+2=?” and so on. But now, those q’s seem to have gotten tougher. I was faced with a “7*9=?” yesterday. Sure took me a while and a few fingers on that one. It was fine till the simple additions, and might still be ok as long as you got enough fingers to calculate on. But as hackers and spamming gets a step further, I shiver to think of the kind of questions we’d be faced with in the years to come, just to prove we’re “still” human. Derivative problem…haha….good one. That ensures the so-called starlets (most of whom r college drop outs) won’t stand a chance, eh? Hahaha.. Am sure a good number of em would be able to.